Socket preservation post-extraction site including preserving dimensions and contour of the alveolar ridge is detrimental for future implantation . Since dimensions, height and width of alveolar ridge would reduce up to 50% during first 12 months after tooth extraction  and buccal surface of alveolar ridge is especially fragile and fragile to be resorbed post teeth-extraction especially in maxillary anterior sites , proper treatment to improve socket preservation is in urgent need. Recent clinical studies with controls illustrated that Guided Bone Regeneration (GBR) was an effective treatment for socket preservation . Avila-Ortiz and colleagues found a membrane in the treatment site, no matter resorbed or not, brought great benefit for preserving mid-buccal and mid-lingual alveolar bone height . The mostly used bone graft material and resorbable membrane are deproteinized bovine bone granules (Bio-Oss, Geistlich, Switzerland) and resorbable collagen sponge (Bio-Guide, Geistlich, Switzerland). Moreover, superiority of combined use of the two materials over other bone graft material and membrane was suggested in some study . However, in clinical practice, the cost for GBR is quite expensive, so cheaper alternatives have been being explored. Among them, Protein Collagen Sponge (PCS) was found to be effective . Classical products of PCS were produced in China and abroad companies . Although the procedure for applying PCS is quite simple in clinic and acceptable effects for preserving alveolar ridge with PCS has been reported in other tissues [6-8], it’s application in oral and teeth has not been explored and the effectiveness of GBR and PCS has not been compared either. Considering the lower cost of PCS, we aim to investigate whether PCS can completely or partially replace the GBR and provide clinical basis for clinical application of PCS. Inclusion criteria: Twelve patients, 8 male and 4 female, aged 43-66 years with a mean age of 53 years, were recruited in this study. All participants had no smoking habit and remained in good health condition, without other complications such as diabetes mellitus and hypertension, etc. A total of 40 teeth (at least three teeth for each patient) were extracted because of periodontitis, trauma, or endodontic problems. Any symptoms of residual teeth were well controlled. Minimally invasive extraction was performed as described  to protect socket walls and peri-alveolar keratinized gingivae tissue. All patients remained stable during subsequent observation. All procedures followed ethical regulations including the World Medical Association Declaration of Helsinki . This study was approved by local medical ethics committee, No. hbbdsdezxyy-20151017-2. Written informed consents were obtained from all participants. Sockets within each patient were grouped for different treatment. PCS and GBR were applied in one socket for each patient and remaining socket (s) served as controls. The choice between experimental and control sockets was made by patients themselves. Patients received antibiotics for 4 days and moth-rinse for 2 weeks. The sutures were removed 10 days after surgery and patients received well-instructed oral hygiene since then. Temporary prosthetic restorations were made with or without support of the rest teeth. The basement of prosthetics was relieved in the region of the studied sockets to avoid resorption of the bone due to pressure points. Implants (Straumman, Switzerland) were placed after an average recovery time of 10 weeks. Group 1 (PCS): Socket was filled with tailored KeJiBang protein collagen sponge to the crest level (Figure 1), and was cross-sutured with 4-0 coated Vicryl suture. 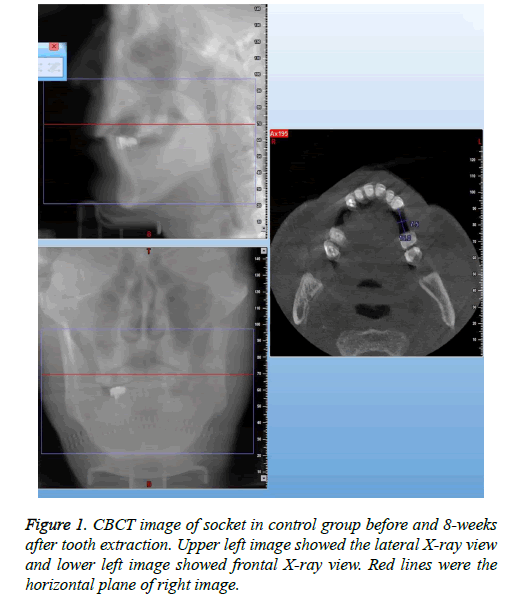 Figure 1: CBCT image of socket in control group before and 8-weeks after tooth extraction. Upper left image showed the lateral X-ray view and lower left image showed frontal X-ray view. Red lines were the horizontal plane of right image. Group 2 (GBR): The margin of socket was bluntly dissected for 2-3 mm space between alveolar ridge and lining epithelium. The alveolar socket was filled with bone graft to crestal level, compressed slightly, and covered with tailored membrane, with the margin of membrane placed in the space premade, and was cross sutured-with 4-0 coated-Vicryl suture. Group 3 (Control): The socket was filled with intact blood clot, and was sutured as previously described. 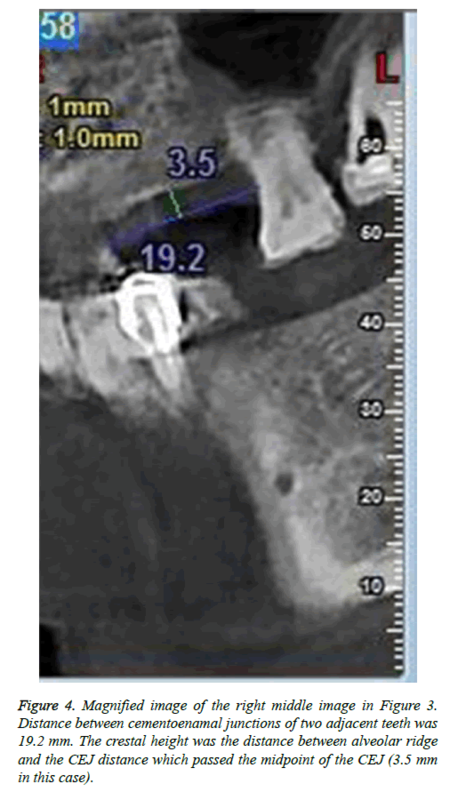 Crestal width and height of the alveolar ridge were measured with CBCT (CBCT, New Tom, Italy) at 0.1 mm resolution. Alveolar crestal width was the distance between two crestal mid-points of buccal and lingual bony walls of the tooth to be pulled out of the socket. The crestal mid-point on bony wall was located on horizontal plane of CT image according to relative stable distance between reference points (cement enamel junctions or crown margins) of two adjacent teeth (Figures 1 and 2). Crestal height was the distance between mid-point of the link between cementoenamal junctions of two adjacent teeth around the lost tooth space and the alveolar ridge (Figures 3 and 4). Changes in the crestal width and height before and 8-week post-extraction were calculated by subtracting post-extraction value with pre-extraction value for further analysis. Figure 2: Magnified image of the right image in Figure 1. Distance between two crown margins was 16.0 mm. The crestal width was the distance between buccal and lingual bony walls which passed the midpoint of crown margins (7.5 mm in this case). 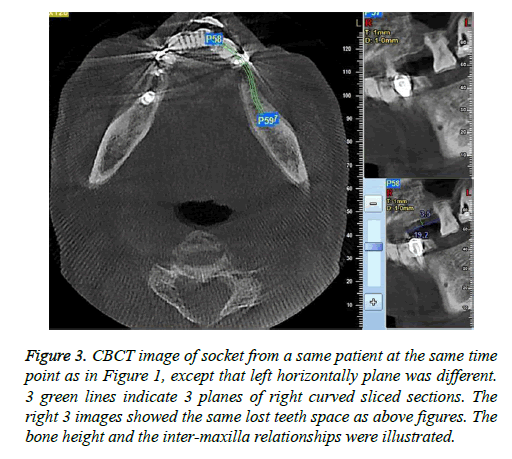 Figure 3: CBCT image of socket from a same patient at the same time point as in Figure 1, except that left horizontally plane was different. 3 green lines indicate 3 planes of right curved sliced sections. The right 3 images showed the same lost teeth space as above figures. The bone height and the inter-maxilla relationships were illustrated. Figure 4: Magnified image of the right middle image in Figure 3. Distance between cementoenamal junctions of two adjacent teeth was 19.2 mm. The crestal height was the distance between alveolar ridge and the CEJ distance which passed the midpoint of the CEJ (3.5 mm in this case). Mean local bone density (in Hounsfield units) was measured with CBCT and calculated by averaging values at 3 mm, 5 mm, and 7 mm under the crestal mid-points 8-weeks post-extraction. The points were located at the perpendicular line to alveolar ridge and in the center of the former extraction socket. All statistical analysis was performed with SPSS 16.0 (SPSS 16.0 for windows, SPSS Inc., Chicago, IL, USA) software package. The differences of the mean values of each index among three groups were compared with Student t-test. A P value of less than 0.05 was considered as statistical significance. All extraction sockets were healed without inflammation symptoms. The collagen sponge-preserving sockets showed excellent healing after suture removal (Figures 5-7). Figure 5: PCS Collagen Sponge inserted in post-extraction socket before suture. After successful extraction of the tooth, all bony walls of the extraction were intact and the socket had been curetted perfectly clean. No apical granulation tissue was left. Figure 6: Ten days after socket preservative surgery before suture removed, the same to Figure 5. The stitches remained at the extraction site. Gum tissue surrounding extraction site exhibited significant repair. Figure 7: Ten days after socket preservative surgery and immediate post suture removing, same case as Figures 5 and 6. After removing stitches, extraction would heal in good condition and no infection was detected. Oral epithelial cells almost covered the extraction wounds. Subsequent implantations were performed in all sockets. The alveolar ridge condition before implantation was normal for all 29 sockets and after the elevation of the flap, and implants could be placed with adequate width and length. Bone graft was not mandatory during the implant placing for 6 sockets with or without socket preservation. For the remaining 5 sockets without preservation, 1-3 mm bone defect in the buccal or labial side was observed after implants placement, hence a slight quantity of bone graft with a small piece of resorbable membrane was covered. No significant differences were observed among different groups in the average width or height of average alveolar ridge (all P>0.05). Reductions in the alveolar ridge crestal width and height were observed in all groups, but differed significantly among treatment groups (Table 1). Table 1: Comparison of crestal width and height changes and bone density among three groups. Mean reduction in alveolar ridge crestal width did not significantly differ between Groups 1 (PCS, 0.92 ± 0.41 mm) and 2 (GBR, 0.83 ± 0.37 mm) (P=0.766), whereas the value in Group 3 (Control, 3.02 ± 0.74 mm) was significantly higher than those in Groups 1 and 2 (both P<0.001). Mean reduction in alveolar ridge crestal height did not significantly differ between Groups 1 (PCS, 0.66 ± 0.52 mm) and 2 (GBR, 0.60 ± 0.58 mm) (P=0.849), where the value in Group 3 (Control, 1.84 ± 0.32 mm) was significantly higher compared with those in Groups 1 and 2 (both P<0.001), as illustrated in Table 1, suggesting that PCS and GBR shared identical effect. At 8 weeks after tooth extraction, the bone density of sockets in Group 2 (GBR) was significantly higher those in Groups 1 and 3 (both P<0.001), and the bone density of sockets in Group 2 (PCS) was significantly higher than that in the control group (P=0.001), as illustrated in Table 1. Socket preservation after tooth extraction is detrimental for aesthetic and long-term stability of subsequent implantation or fixed restoration [3,11,12], which are in line with our current study in teeth as the dimensions of the alveolar ridge were greatly preserved both horizontally and vertically 8-week after tooth extraction. The materials used in this study yielded excellent alveolar ridge preservative effect upon minimizing the reduction of dimensional changes, increasing bone density and facilitating implant surgery [13-15]. However, few studies indicated that granules may impede healing of extracted sockets because of difficulty in the absorption of tiny granules [16-18]. In the sockets treated with PCS, alveolar ridge dimensions were well preserved. Slight differences were observed between two types of materials both horizontally and vertically. Thus, collagen sponge yields satisfactory performance on bone formation. Lim JH and his colleagues  had applied collagen sponge to fill the intrabony cavity after cyst excision surgery and found the previous lesion was well healed and new bone formed at postoperative 3 years. Dimensional preservative effect of two types of collagen sponge did not significantly differ in terms of the absorption time and healing time, etc. In terms of bone density, the effect of GBR was remarkably greater than those of the PCS or control groups, partly resulting from that GBR granule was not fullt absorbed at postoperative 8 weeks. Bone density of PCS group was significantly higher than that in the control group, whereas significantly less than that in the GBR group, probably because of the specific features of protein collagen sponge. Bone density indicated inappropriate but not hard feature for drilling during implant surgery, so it does not represent the disadvantages for clinical application. The price for PCS protein collagen sponge is cheaper than that of GBR collage sponge, while cost of collagen sponge (25 mm × 50 mm) is 80 RMB, which is much less than of GBR combination. Considering the comparable effect, PCS protein collagen sponge could be an alternative for wide application of socket preservation after tooth extraction. The primary purpose of this study is to compare the effectiveness of GBR and PCS on socket preservation post tooth-extraction by selecting the parameters of crestal width and height of the alveolar ridge, etc. In the study design, the quantitative aspects are mainly emphasized to offer preliminary outcomes. Therefore, in next study, we’ll attempt to supplement qualitative data to complete the study design and enhance the quality of the research. Avila-Ortiz G, Elangovan S, Kramer KW, Blanchette D, Dawson DV. Effect of alveolar ridge preservation after tooth extraction: a systematic review and meta-analysis. J Dent Res 2014; 93: 950-958. Vittorini OG, Clementini M, De Risi V, de Sanctis M. Surgical techniques for alveolar socket preservation: a systematic review. Int J Oral Maxillofac Implants 2013; 28: 1049-1061. Kubilius M, Kubilius R, Gleiznys A. The preservation of alveolar bone ridge during tooth extraction. Stomatologija 2012; 14: 3-11. Chan HL, Lin GH, Fu JH, Wang HL. Alterations in bone quality after socket preservation with grafting materials: a systematic review. Int J Oral Maxillofac Implants 2013; 28: 710-720. Shakibaie MB. Comparison of the effectiveness of two different bone substitute materials for socket preservation after tooth extraction: a controlled clinical study. Int J Periodontics Restorative Dent 2013; 33: 223-228. Kim YK, Yun PY, Lee HJ, Ahn JY, Kim SG. Ridge Preservation of the molar extraction socket using collagen sponge and xenogeneic bone grafts. Implant Dent 2011; 20: 267-272. Lim JH, Huh JK, Park KH, Shin SJ. Autotransplantation of an impacted premolar using collagen sponge after cyst enucleation. J Endod 2015; 41: 417-419. Chung JH, Nam JW, Kim KW. Effects of atelocollagen sponge (Teruplug®) insertion on the periodontal healing of second molars after impacted mandibular third molar extraction. Int J Oral Maxillofac Surg 2009; 38: 567. Shakibaie MB. Socket and ridge preservation from the three-dimensional perspective. Dent Mag 2009; 2: 24-33. World Medical Associatio. The World Medical Associations Declaration of Helsinki, Ethical Principles for Medical Research Involving Human Subjects. World Med Assoc 2015. Horowitz R, Holtzclaw D, Rosen PS. A review on alveolar ridge preservation following tooth extraction. J Evid Based Dent Pract 2012; 12: 149-160. Hauser F, Gaydarov N, Badoud I, Vazquez L, Bernard JP, Ammann P. Clinical and histological evaluation of postextraction platelet-rich fibrin socket filling: a prospective randomized controlled study. Implant Dent 2013; 22: 295-303. Artzi Z, Nemcovsky CE. The application of deproteinized bovine bone mineral for ridge preservation prior to implantation. Clinical and histological observations in a case report. J Periodontol 1998; 69: 1062-1067. Artzi Z, Tal H, Dayan D. Porous bovine bone mineral in healing of human extraction sockets. Part 1: histomorphometric evaluations at 9 months. J Periodontol 2000; 71: 1015-1023. Indovina A, Block MS. Comparison of 3 bone substitutes in canine extraction sites. J Oral Maxillofac Surg 2002; 60: 53-58. Jayaraman S. Intervention for replacing missing teeth: alveolar ridge preservation techniques for dental implant site development-evidence summary of Cochrane review. J Indian Prosthodont Soc 2015; 15: 381–385. Atieh MA, Alsabeeha NH, Payne AG, Duncan W, Faggion CM, Esposito M. Interventions for replacing missing teeth: Alveolar ridge preservation techniques for dental implant site development. Cochrane Database Syst Rev 2015; 5: 010176. Mardas N, Chadha V, Donos N. Alveolar ridge preservation with guided bone regeneration and a synthetic bone substitute or a bovine-derived xenograft: a randomized, controlled clinical trial. Clin Oral Implants Res 2010; 21: 688-698.